People can be so truculent, never missing an opportunity to censure others. That’s what makes Planet Fitness’ storied promise of a “Judgement [sic] Free Zone” so appealing. Yet behind the appeal is a shadowy void; the very act of establishing such a zone involves judgment. 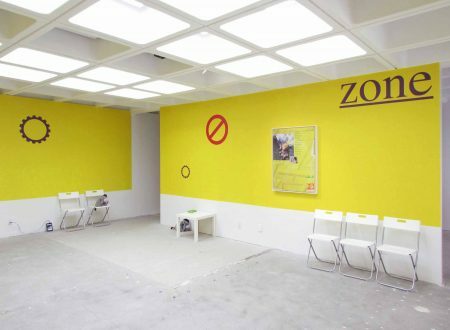 In his current show at And/Or Gallery in Pasadena, Jacob Ciocci incorporates Planet Fitness logos into an installation inviting viewers to question institutionalized empty promises. A quick Internet search reveals that the popular gym chain is not so non-judgmental, after all. Stringent rules discriminate against bodybuilders1; and based on strict dress codes, the gym has expelled members including a belly-baring pregnant woman2 and a Muslim woman wearing a headscarf3. There’s even a Facebook page called “Planet Fitness is NOT Judgement [sic] Free”. Planet Fitness declares itself “a genuine refuge where everyone can be free,”4 yet its regulations declare the opposite. Establish rules that protect some at others’ expense, then boast of freedom; shroud discriminatory attitudes in murky claims of open-mindedness: these hypocritical paradoxes exemplify our polarized, post-truth society. Just like Planet Fitness itself, variations on its ethos are everywhere. Ciocci explores such archetypes’ implications by parodically appropriating the gym chain’s familiar rhetoric whose ubiquity renders the fallaciousness of its phony feel-good pledge of fairness all the more disquieting. Gallery walls are painted with Planet Fitness’ signature yellow and purple and adorned with the fitness chain’s cogwheel motifs. 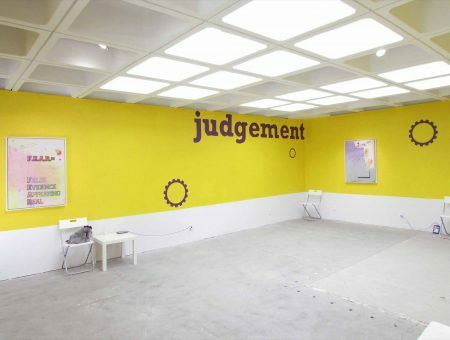 However, vinyl letters declare the exhibition space a “Judgement [sic] Zone”. 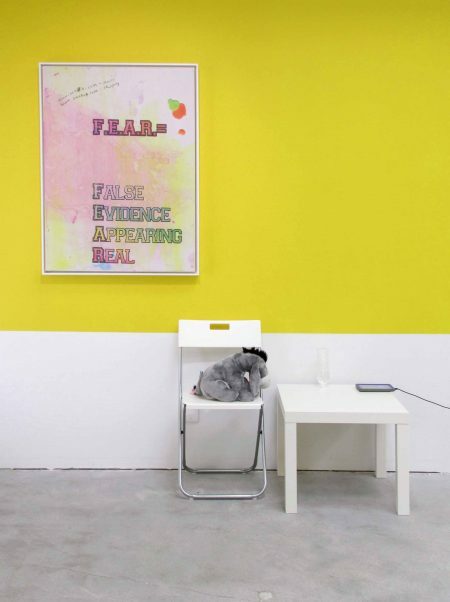 The multi-layered irony of omitting “Free” reverses Planet Fitness’ motto, calls attention to the gallery as a place for evaluating the speciousness of such an ethos, and acknowledges the viewer’s capacity to judge the displayed artwork. 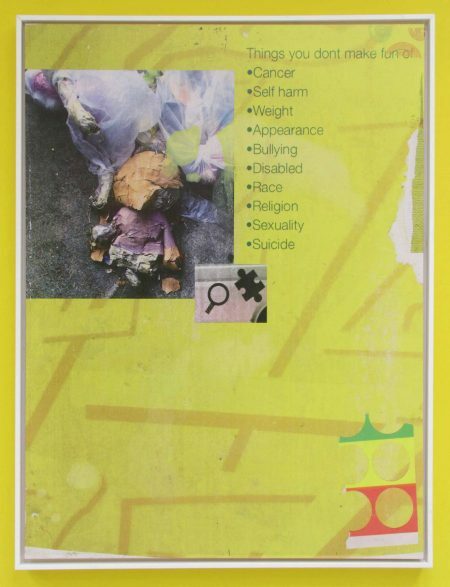 Underscoring the fact that a judgment-free zone involves rules entailing judgement, a picture called sick (print) (all works 2017) lists “Things You Don’t Make Fun Of”: Cancer, Self-Harm, Weight, et cetera. Don’t Listen (print) declares, “F.E.A.R.= False Evidence Appearing Real” against a splotchy pastel background. Like judgement [sic] zone and sick (print), this pointedly reprehends propagandistic platitudes embodying authorities’ inversions of reality. More ambiguous prints augment the cynically quotidian ambiance, depicting empty phrases, possibly clipped from motivational texts or advertisements, against incongruous backgrounds. Nondescript white folding chairs and matching tables line the gallery walls, affecting a waiting room. Small Eeyore stuffed animals, symbols of “socially-acceptable depression” according to the press release, occupy a few of these chairs; nearby, computer tablets in brightly hued sheaths play disjointed video clips, but are more interesting as symbolic tokens of absent people. This could be a therapist’s lobby or the eerie meeting place of a virtual support group whose participants are only present via their Internet-connected tablet surrogates. In the adjacent room, a deliberately lame video called freedom isn’t free shows a barely coherent assortment of low-quality clips collaged together and overlaid with an ineffectual monologue during which a male narrator utters motivational banalities, like “facing your demons,” and makes quasi-hypocritical pronouncements: “If you don’t have demons, I don’t have anything to say to you.” Perhaps he embodies the artist. Futility suffuses this video’s form and content. Likewise, the total installation seems direly lacking. There is no focal point. Individual artworks and their concomitant details seem inconsequential compared with the total setup. Due to the installation’s apparent technical naiveté, dearth of content, and lack of engaging detail, the viewer is liable to find himself wandering aimlessly about, cursorily checking the videos rather than actually watching them. This formally disappointing vacuousness seems to be part of Ciocci’s point; it mirrors the inane worlds of offices and waiting rooms, social media and e-mail. It’s tempting to sit down and dabble with one of the tablets; however, one must remember that this is a gallery installation—are the chairs really meant to be used? The viewer doesn’t quite know what’s expected of him. Uncertainty and false invitingness render the gallery an uncomfortable cloister feigning something it is not. Digital artworks often exist so amorphously and use such obscure references that it’s difficult to gather what the artwork entails, much less what it means. Ciocci has aptly packaged his work for a gallery setting, employing the short-form ambiguity of the Internet to highlight our capacity for indoctrination by way of distractedness in the tangible world.